User Account Control or UAC is being designed for giving the users of Windows 7 better experience while using that operating system, and also for protecting the security in the system. Minimize unnecessary or matching prompts in Windows and ecosystem, so that critical prompts may be identified more easily. Enable our customers for being more confident, so that they can get more control on their systems. In UAC settings page, some other options are available with which the users of Windows 7 can tweak or configure User Account Control according to their preferences. For example, to opt for suppressing prompt that requests for more elevation acceptance. The settings provided by UAC are now so configured that the various levels are present in slider bar. The user will be notified earlier if programs or the user himself make any sort of changes in his computer or the Windows settings, which requires the permissions for an administrator. After being notified the user’s desktop will be blurred, and the user must either choose to or deny that request in User Account Control dialog box, before the user can do other things on their computer. The blurring of the desktop is being denoted as secure desktop, as other programs will not run while the desktop is blurred. The above mentioned setting is very important to secure computers. When the user is being notified, they should carefully read the contents of each and every dialog box before they decide to allow changes, which are to be made in the user’s computer. 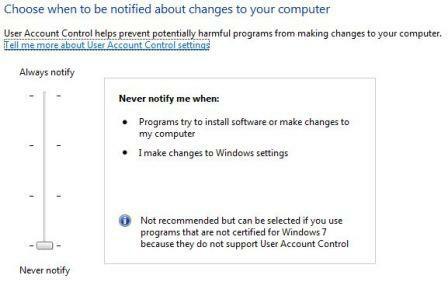 By default, the uses will be notified only when programs will try to make the changes in their computer. They won’t be notified when they personally make changes to the Windows settings. The user will be notified immediately when programs make changes in the user’s computer, or in Windows settings which require permissions of the administrator. Whenever the users are notified, their desktop will be blurred. The blurring of the desktop is referred as secure desktop as other programs will not run when it is blurred. The above mentioned setting has medium level when security is considered. It is generally safe to allow the alterations to be made in Windows settings, which are done by the user without being notified. Although, there are certain programs which sneak into Windows may get access to data which is being passed to them as well, and the malicious software may take advantage of the situation by just using the programs change settings in your computer. This setting is not recommended for the systems as the changes can be easily done by external programs and by the users. The system will be very vulnerable if you choose to select this setting, and it is absolutely not recommended to select this option, due to high security risks which could even lead to overall computer crash.